The Ally folding canoe series imported to the U.S. by Bergans of Norway offer unrivaled convenience without sacrificing performance. So much so that world-class athletes like Ceclie Skog and Rune Gjeldnes used Ally’s during their 2011 North Pole expedition; and Aaron Chervenak and Gareth Jones are crossing Brazil from north to south in an Ally on a historical human-powered journey of over 5500 miles. These canoes are also highly appreciated by weekend paddlers who face storage space issues at home or in transport; and their relative light weight makes portages less daunting. They are ideal for Alaskan adventures involving float-plane and boat portage. All models are designed for both pleasure cruising and wilderness touring. They are responsive in all situations, and are particularly valuable for those who have a need for silent movement on the water…for fishermen, photographers and hunters they are ideal crafts. The idea for the Ally canoe began in 1972 when Ragnar Jensen, now owner/operator of Bergans of Norway, desired a canoe that would excel in wilderness travel but also were foldable. The first model was basically a 15-foot long box with screws. Soon after, Ragnar designed and built a very slim and fast 17-foot boat using the current aluminum frame and a PVC-coated fabric design. This canoe won the Kungsbacka River Canoe Race in Kungsbacka, Sweden among other races. In 1976 Ally started licensing production in Canada, which made Ally canoes available in the U.S. market In 2000, Ally redesigned the bow and gunwale interface, which provided greater overall structural integrity and consistent skin tension and boat shape for predictable performance on the water. In 2010, new performance oriented ergonomic seats and the current chine and crossbar Nylon locking system was added, and in 2011 Ally introduced a 16’ model that combined some of the stability of the 16.5’ with the speed and directional stability of the 17’. The Ally 16.5′ Canoe is the perfect choice for those who need its large carrying capacity of 835 lbs. and optimum performance in all conditions, from a day with the family (holding two adults and two kids without gear) to technical river adventures (with room for two adults with gear). 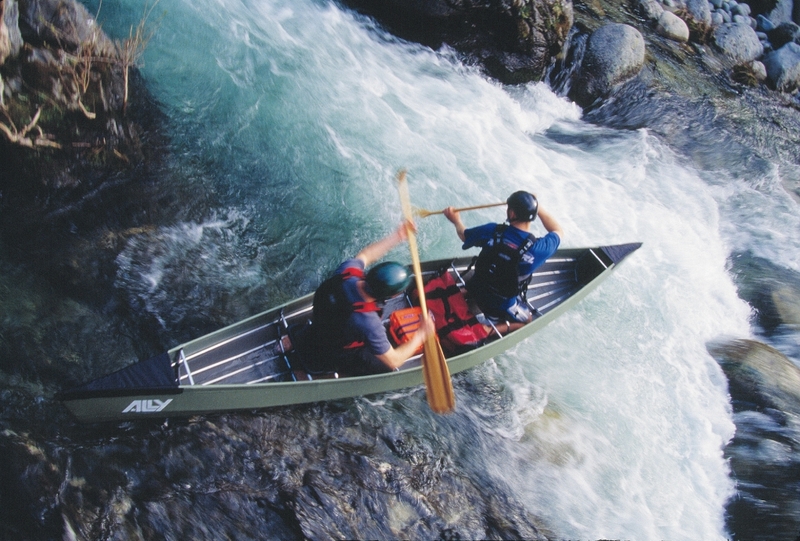 It’s a lightweight but highly stable boat on still waters and in rivers yet maneuverable enough for heavy white water. It features an aluminum frame, dual-density closed-cell foam mat and durable PVC outer fabric, which absorbs shocks and impacts and makes for a versatile, easy to paddle boat. And, like all Allys, it’s collapsible, making the 44-pound boat easy to carry and store in a convenient backpack (pack sold separately). It has a length of 16 feet, five inches, a width of 37.5 inches, a gunwale width of 36 inches, a waterline width of 33.5 inches, depth of 14 inches, a height at the bow of 18.5 inches, and an MSRP of $2,050. Though the 16.5′ boat may be the most versatile, all of Ally’s seven canoe models (13.7′, 15’, 15.5′, 16.5’, 17′, 18’ and 18.5′) have the same construction and portability that make them revolutionary. The Norwegian-made 6082-T6 aluminum tubing is the backbone of the Ally crafts. The select quality of this framework excels in strength and rigidity while still offering the flexibility required in heavy water. The Nylon PA 66 connecting plastic details are made to withstand stress and all the rigors of wilderness travel. The Ally’s 700 g/m² skin consists of a woven fabric coated on both sides with PVC, resulting in a lightweight but very strong shell. It has little stretch which results in a very tight and robust outer layer for the canoes. The bottom is made of a heavier and even stronger reinforced 1050 g/m² PVC skin for the highest degree of resilience in river paddling and landing at rocky shores. 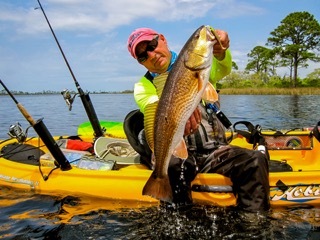 The two-layer foam mat lying between the skin and the aluminum frame provides shock absorption, float, and insulation against cold water while paddling in the kneeling position. The firmer, black foam layer of the mat faces up. The skin can easily be field repaired as a hole or rip can be mended just like a bicycle inner tube. All parts of the aluminum tubing are numbered and can be replaced. 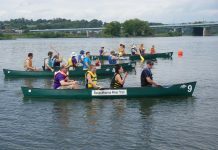 The assembly of an Ally canoes takes anywhere from 30 minutes to one hour, depending on the skills and experience of the user. The first time it may take a little longer to stretch the tight-fitting skin over the hull, but all that is required is the rubber mallet supplied with the canoe. Ally comes in different shapes and sizes. 15’, 16.5’ and 18’ hulls resemble the “Prospector” hull from the early days of the 20th century. This shape was recognized as the ideal workhorse of traders in the backcountry of the Canadian wilderness. Plenty of freeboard, a wide belly, voluminous rounded ends, a rocker and a round bottom were the typical attributes of this all round craft, maintaining the symbiosis of high payload, speed, maneuverability and white water suitability in these canoes. Their buoyant bow lets the boat rise above any waves. 13.7′, 15.5′, 17‘ and 18.5′ hulls have a straight keel, narrow and straight ends and a sleeker shape, lending themselves to open water cruising, with slightly lower cargo capacity but with considerable higher speed. 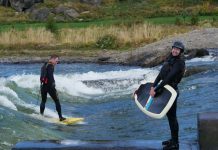 They effortlessly cut waves and paddle smoothly from early morning until late in the day. These canoes convey a marginally lesser initial stability in the beginning, but make up for it with ease of touring on longer trips. The 16’ hull with a wide belly and narrow ends is a combination of the above-mentioned qualities. This length is suitable for use as a tandem or a solo craft. Adjustment of the seats in height, angle and position in the boat allow you to achieve correct trimming of the boat and a high degree of comfort while paddling, whether sitting or kneeling (for better control, stability and ease of paddling).